Love International has revealed its boat party schedule for its 2019 edition. The voyages on the Argonaughty and the Martina will run during the festival in The Garden Tisno from Wednesday, July 3rd to Wednesday, July 10th with just 200 souls on board each. 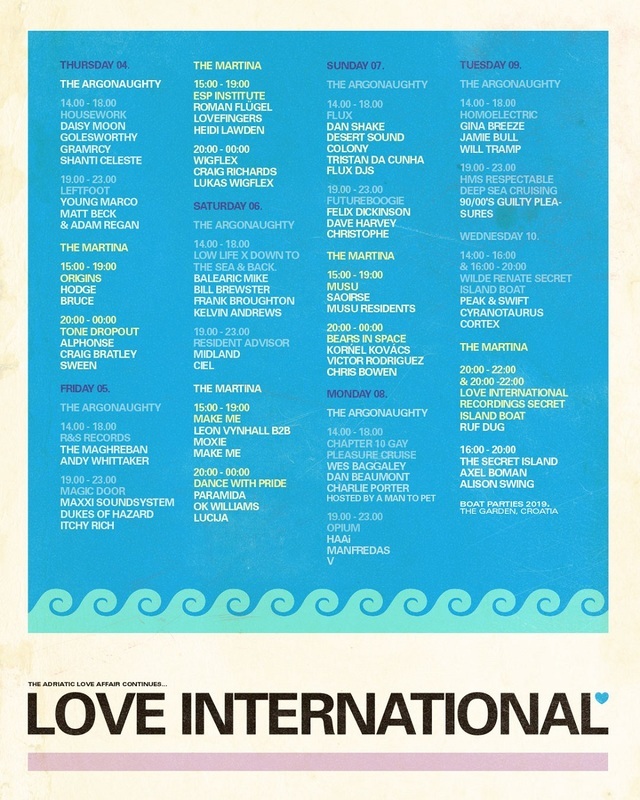 Love International headliners this year include: DJ Harvey, Andrew Weatherall, Ben UFO, Peggy Gou, A Love From Outer Space, Craig Richards B2B Nicolas Lutz, Beautiful Swimmers, Horse Meat Disco, Crazy P Soundsystem, Joy Orbison, Leon Vynehall, Midland, Shanti Celeste B2B Saoirse, Vladimir Ivkovic b2b Ivan Smagghe, Roman Flügel, Studio Barnhus, Young Marco, Paranoid London Live, Call Super, Gerd Janson, Optimo, DMX Krew Live, Dan Shake, Josey Rebelle, Moxie, Prosumer, Orpheu The Wizard and Haai. For tickets and details go to loveinternationalfestival.com.